To celebrate 30 years of brewing, BridgePort Brewing Company is releasing a trilogy of beers commemorating the occasion. For this review, we have number 1 of the trilogy, a crystal dry-hopped pale ale! 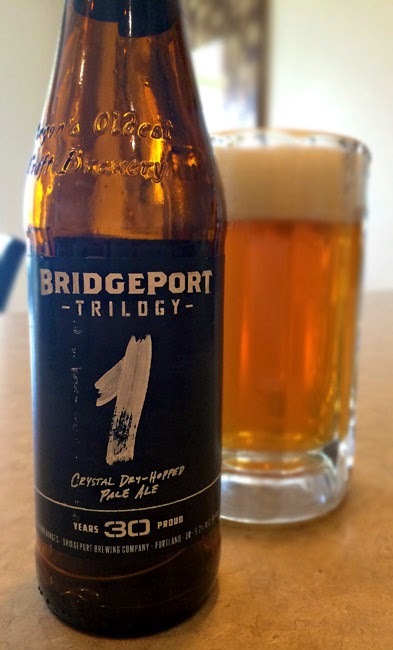 BridgePort's Trilogy #1 comes in at a reasonable 5.2% and 40 IBU's. It pours a slightly cloudy gold color with a moderately thick head considering it's a pale ale. Aromas are mainly of fresh citrus zest and a vague maltiness. Tasting brings relatively mild notes of dry grapefruit and citrus pith followed by a bready, almost doughy taste. It finishes quite dry with more hints of dry, mellow citrus, though hops remain subdued and muted throughout. All in all, a decent pale ale. Really quite dry, but not bitter or hoppy. Nothing special, but would still be a reasonable weekday beer alongside a roasted pork loin or turkey. Drink This: if you're looking for a decent everyday pale ale. Don't Drink This: if you want a mind-blowing beast of a beer for special occasions, or even an above average beer for the weekend. I even find this a little too dry and subdued to be refreshing on a hot day. But hey, still plenty drinkable!